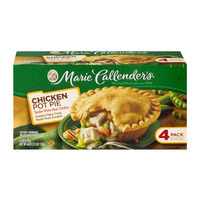 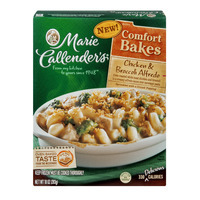 Marie Callenders Frozen Meals And Confectioneries; Quick & Easy! 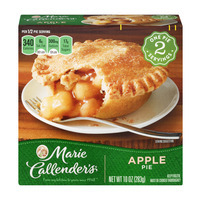 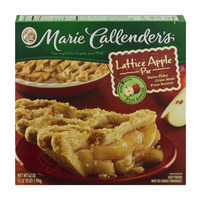 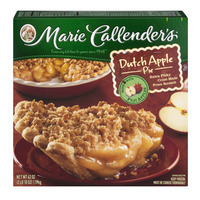 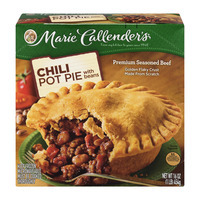 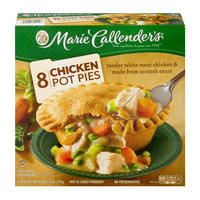 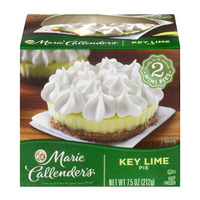 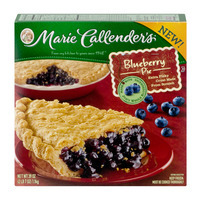 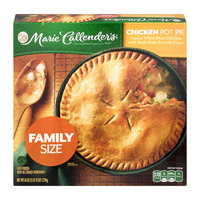 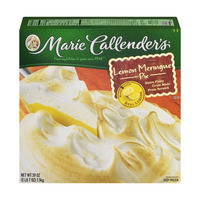 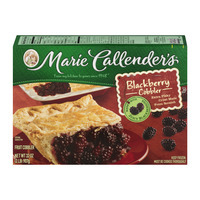 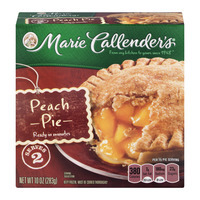 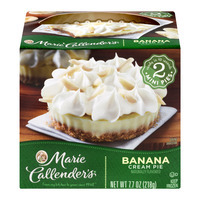 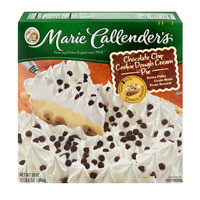 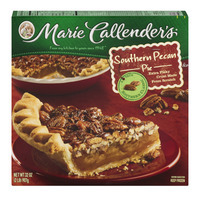 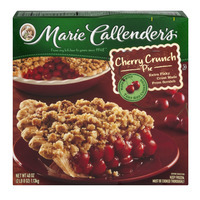 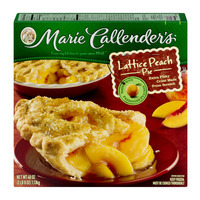 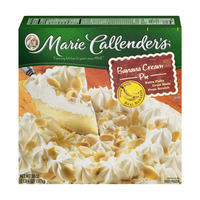 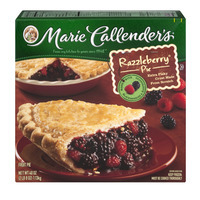 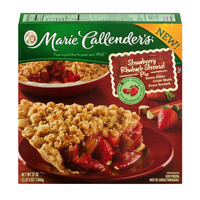 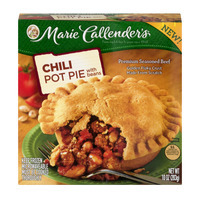 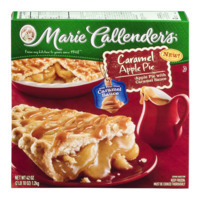 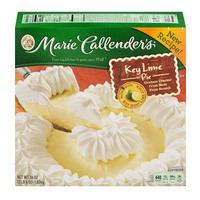 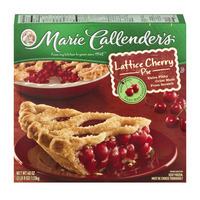 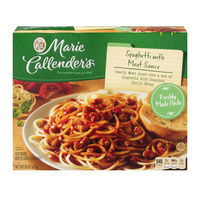 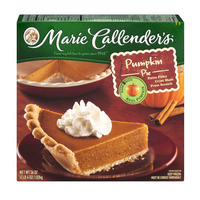 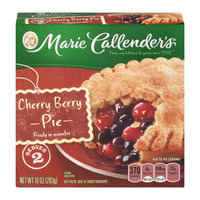 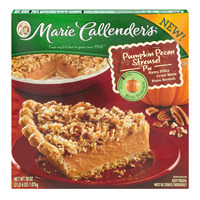 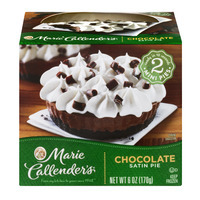 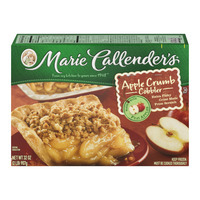 Marie Callenders can be found in your local store's frozen section! 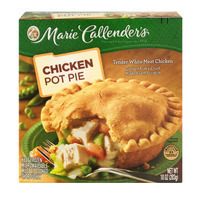 Convenient and tasty with a manageable calorie count (along with fat, sugars and such.) 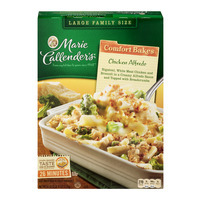 Make a daily meal or lunch easy with these delicious food items. 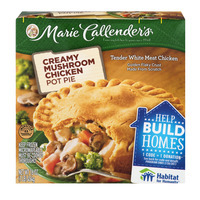 As always, count on Food Run Fix to get them to you quick! 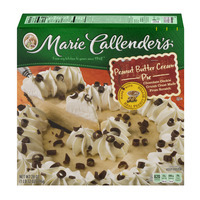 *Bear with us: Desserts coming right up! "Premium Turkey Breast, Golden Flaky Crust Made from Scratch." 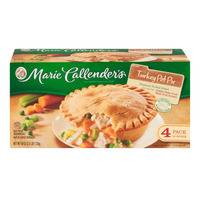 "Premium Turkey Breast, Golden Flaky Crust, Made from Scratch." 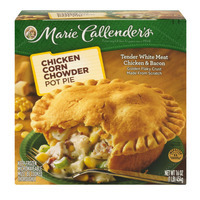 "Tender White Meat Chicken, Golden Flaky Crust Made from Scratch." 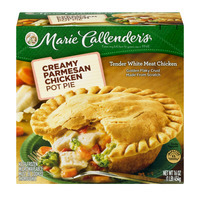 "Tender White Meat Chicken With Made From Scratch Crust." 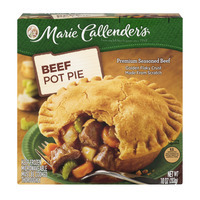 "Premium Seasoned Beef, Golden Flaky Crust, Made from Scratch." 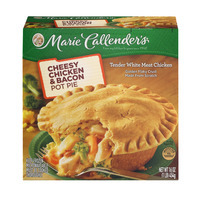 "Tender White Meat Chicken & Bacon, Golden Flaky Crust Made from Scratch." 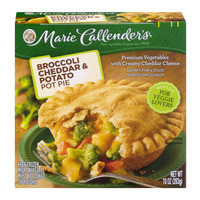 "For Veggie Lovers, Golden Flaky Crust, Made from Scratch." 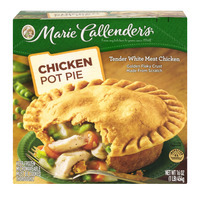 "Tender White Meat Chicken. 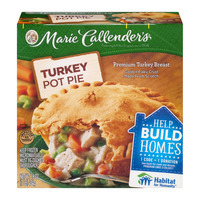 Crust Made from Scratch." 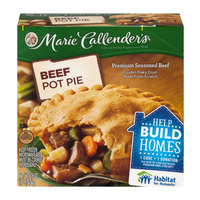 "Premium Seasoned Beef, Golden Flaky Crust Made from Scratch." 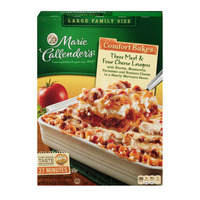 "Freshly Made Lasagna Layered With A Hearty Marinara Sauce And Four Cheeses." 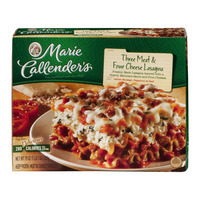 "Ricotta, Mozzarella, Parmesan, Romano Cheese In A Hearty Marinara Sauce." 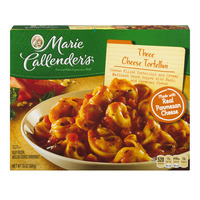 "Cheese Filled Tortellini & Creamy Marinara Sauce Topped With Basil And Parmesan Cheese." "Hearty Meat Sauce Over A Bed Of Spaghetti With Seasoned Garlic Bread." 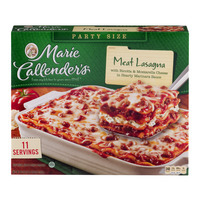 "With Ricotta & Mozzarella Cheese In Hearty Marinara Sauce." 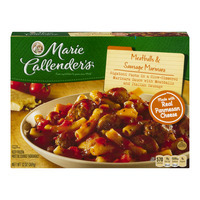 "Rigatoni Pasta In A Slow Simmered Marinara Sauce With Meatballs And Italian Sausage." 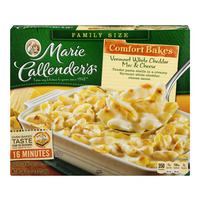 "Macaroni Pasta In A Creamy Cheese Sauce." 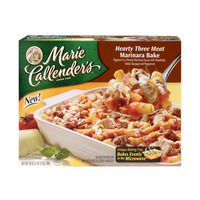 "Rigatoni In A Hearty Marinara Sauce With Meatballs, Italian Sausage & Pepperoni." 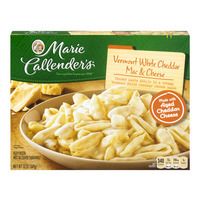 "Tender Pasta Shells In A Creamy Vermont White Cheddar Cheese Sauce." 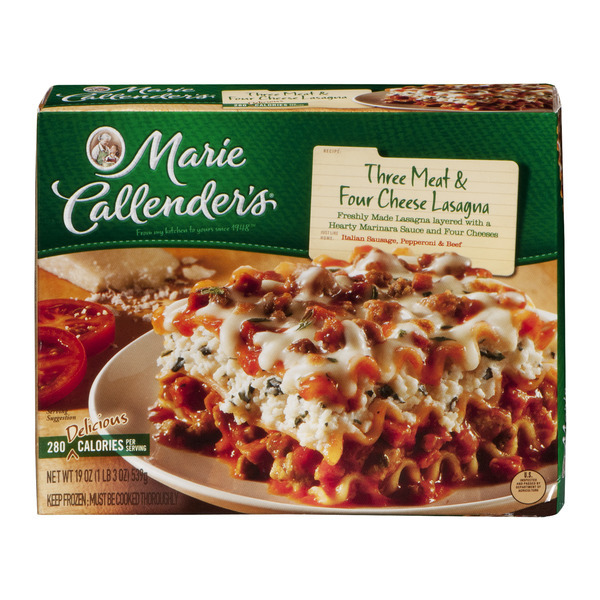 "3 Meat With Ricotta, Mozzarella, Parmesan, Romano Cheese In A Hearty Marinara Sauce." 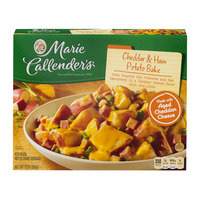 "Potatoes In A Creamy Cheese Sauce With Ham." 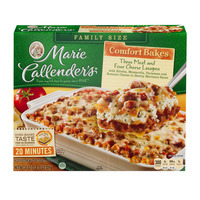 "Meat And Pasta In Meat Sauce With Cottage Cheese. 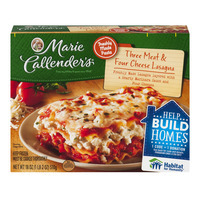 Topped With Real Mozzarella Cheese." 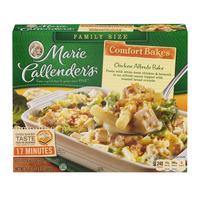 "Rigatoni, White Meat Chicken And Broccoli In A Creamy Alfredo Sauce. 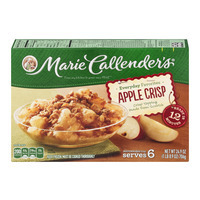 Topped With Breadcrumbs." 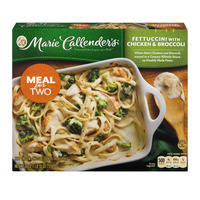 "Pasta With White Meat Chicken And Broccoli In An Alfredo Sauce Topped With Toasted Bread Crumbs." 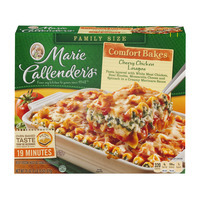 "Pasta Layered With White Meat Chicken, Real Ricotta, Mozzarella Cheese And Spinach In A Creamy Marinara Sauce." 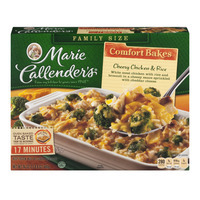 "White Meat Chicken With Rice And Broccoli In A Cheesy Sauce Sprinkled With Cheddar Cheese." 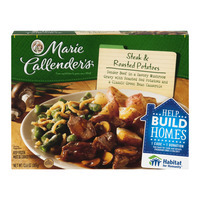 "Tender Beef In A Savory Mushroom Gravy With Roasted Red Potatoes And A Classic Green Bean Casserole." 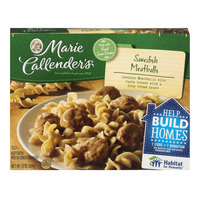 "Swedish Meatballs With Pasta Tossed With A Real Sour Cream Sauce." "Cheese Filled Tortellini And Creamy Marinara Sauce Topped With Basil And Parmesan Cheese." 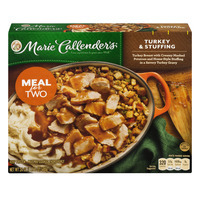 "Meal For 2, Turkey Breast With Creamy Mashed Potatoes & Home Style Stuffing In Savory Turkey Gravy." 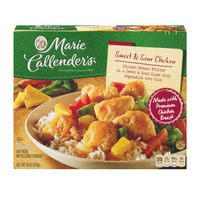 "Chicken Breast Fritter In A Sweet And Sour Glaze With Vegetables Over Rice." "Penne Pasta And Roasted Garlic Sauce With White Meat Chicken And Roma Tomatoes." 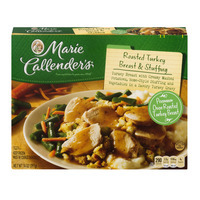 "Turkey Breast With Creamy Mashed Potatoes, Home Style Stuffing & Vegetables In A Savory Turkey Gravy." "Salisbury Steak With Roasted Potatoes & Home Style Gravy Served With Cheesy Broccoli & Cauliflower." 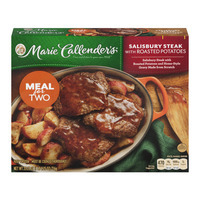 "Meal For 2, Salisbury Steak With Roasted Potatoes & Home Style Gravy Made From Scratch." 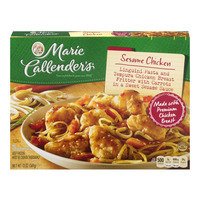 "Linguini Pasta And Tempura Chicken Breast Fritter With Carrots In A Sweet Sesame Sauce." 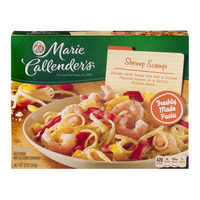 "Shrimp With Pasta And Red & Yellow Peppers Tossed In A Garlic Butter Sauce." 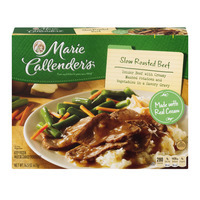 "Tender Beef With Creamy Mashed Potatoes And Vegetables In A Savory Gravy." 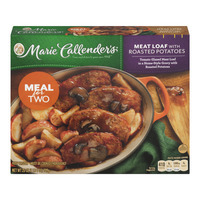 "Meal For Two, Tomato Glazed Meat Loaf In Home Style Gravy With Roasted potatoes." 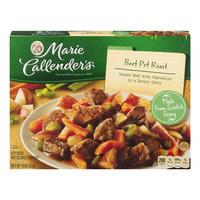 "Rice With Sliced Beef, Carrots And Green Onions In A Sweet Asian Style Brown Sauce." 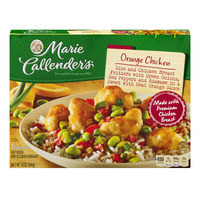 "Rice And Chicken Breast Fritters With Green Onions, Red Peppers, And Edamame (Soy Beans) In A Sweet With Heat Orange Sauce." 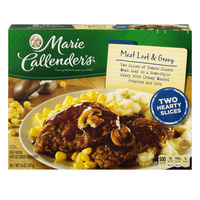 "2 Slices Of Tomato Glazed Meat Loaf In A Home Style Gravy With Creamy Mashed Potatoes & Corn." 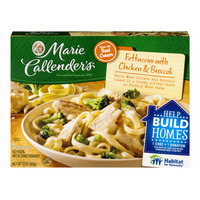 "White Meat Chicken And Broccoli Tossed In A Creamy Alfredo Sauce On Freshly Made Pasta." 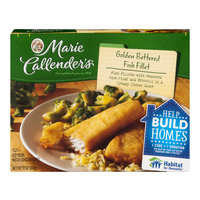 "Fish Fillets With Seasoned Rice Pilaf And Broccoli In A Creamy Cheese Sauce." 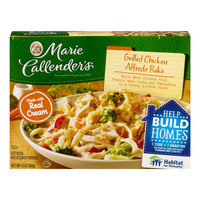 "White Meat Chicken With Freshly Made Pasta And Vegetables In A Creamy Alfredo Sauce." 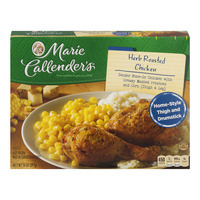 "Tender Bone In Thigh & Leg Chicken With Creamy Mashed Potatoes And Corn." 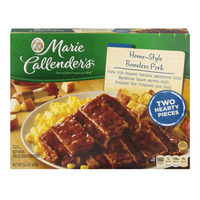 "Pork Rib Shaped Patties Smothered With BBQ Sauce Served With Roasted Red Potatoes And Corn." 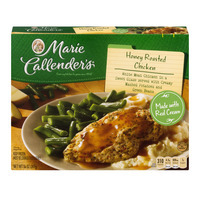 "White Meat Chicken In A Sweet Glaze Served With Creamy Mashed Potatoes And Green Beans." 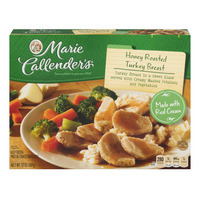 "Turkey Breast In A Sweet Glaze Served With Creamy Mashed Potatoes & Vegetables." 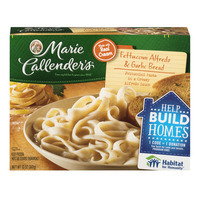 "Fettuccini Pasta In A Creamy Alfredo Sauce." 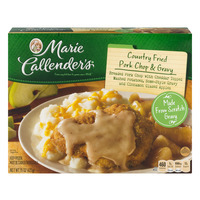 "Breaded Pork Chop With Cheddar Topped Mashed Potatoes, Home Style Gravy & Cinnamon Glazed Apples." 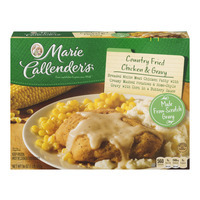 "Breaded White Meat Chicken Patty With Creamy Mashed Potatoes And Home Style Gravy With Corn In A Buttery Sauce." 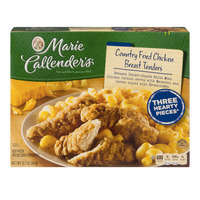 "Breaded Tender Shaped White Meat Chicken Patties Served With Macaroni & Cheese Topped With Bread Crumbs." 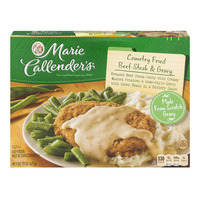 "Breaded Beef Steak Patty With Creamy Mashed Potatoes & Home Style Gravy With Green Beans In A Buttery Sauce." 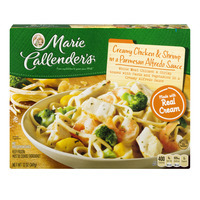 "White Meat Chicken And Shrimp Tossed With Pasta And Vegetables In A Creamy Alfredo Sauce." 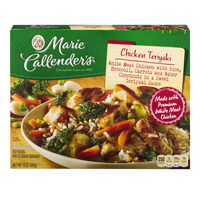 "White Meat Chicken With Rice, Broccoli, Carrots And Water Chestnuts In A Sweet Teriyaki Sauce." 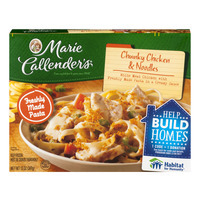 "White Meat Chicken With Freshly Made Pasta In A Creamy Sauce." 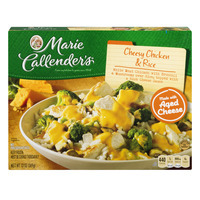 "White Meat Chicken With Broccoli And Mushrooms Over Rice, Topped With A Rich Cheese Sauce." "Oven Roasted White Meat Chicken & Broccoli In A Creamy Alfredo Sauce Over Cavatappi Pasta." 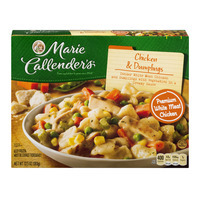 "White Meat Chicken, Dumplings, Vegetables In A Creamy Sauce." 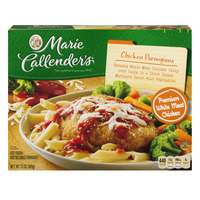 "Breaded White Meat Chicken Patty Over Pasta In A Three Cheese Marinara Sauce With Vegetables." 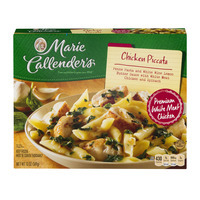 "Penne Pasta And White Wine Lemon Butter Sauce With White Meat Chicken And Spinach." 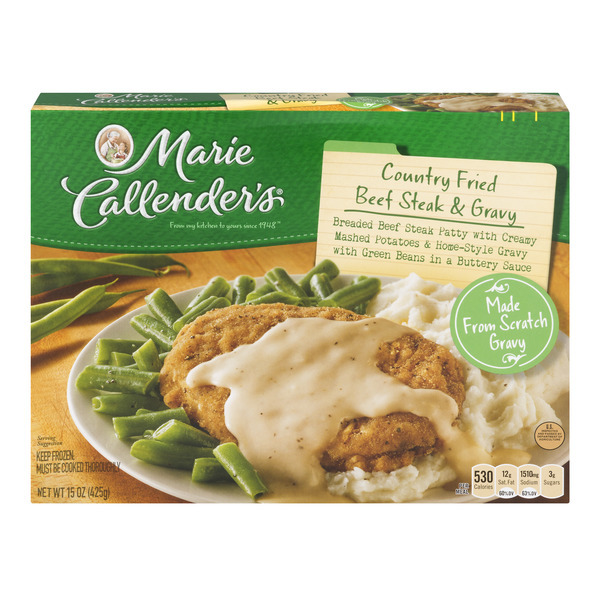 "Tender Beef With Vegetables In A Savory Gravy." "Tender Pieces Of Braised Beef With Roasted Red Skin Potatoes, Pearl Onions & Carrots In A Savory Gravy." 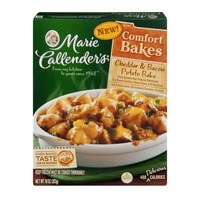 "Oven Roasted Red Potatoes Smothered In A Bacon Cheddar Cheese Sauce With Scallions." 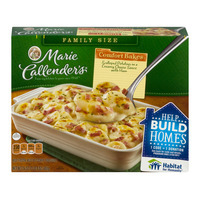 "Oven Roasted Red Potatoes And Ham Smothered In A Cheddar Cheese Sauce With Scallions." 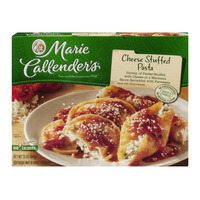 "Variety Of Pastas Stuffed With Cheese In A Marinara Sauce Sprinkled With Parmesan; Made With 3 Cheeses." 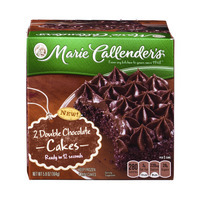 "2 Mini Cakes, 2 Servings. 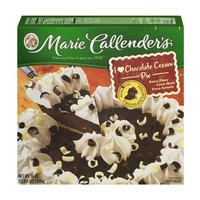 300 Calories, 4.5g Saturated Fat, 360mg Sodium, 25g Total Sugars Per One Cake." 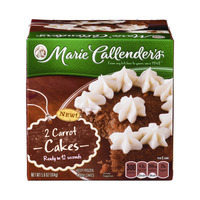 "2 Mini Cakes, 2 Servings. 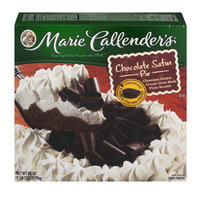 280 Calories, 3g Saturated Fat, 220mg Sodium, 29g Total Sugars Per One Cake." 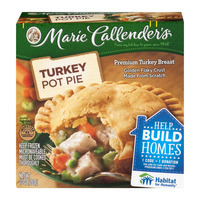 "Extra Flaky Crust Made From Scratch." 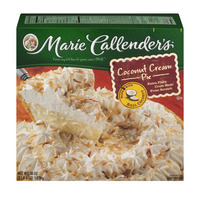 "One Pie, 2 Servings. 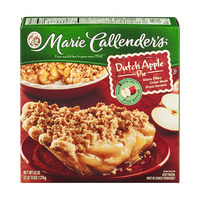 Made From Scratch."